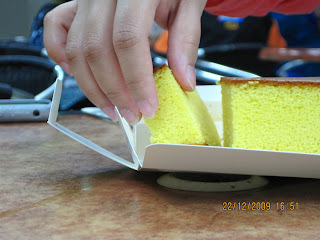 Cake lovers all over the world surely must have heard of Nagasaki Castella (picture). It is a Japanese sponge cake (made of egg yolks, brown sugar crystals, refined white sugar, thick rice syrup and flour) and is said to be popular in Japan and other parts of the world. I first tasted the cake in December 2007 after attending the Second Asian City Journalist Conference (ACJC) which was held in Fukuoka City, Japan. (The conference was jointly organised by UN Habitat Regional Office for Asia and the Pacific (Fukuoka) and The Nishinippon Newspaper). I had plenty of time before my flight home. So I browsed the shelves of one of the duty-free shops at Fukuoka International Airport for something interesting to buy and I chanced upon individually wrapped long boxes which looked very attractive from where I was standing. The boxes contained the Nagasaki Castella. I love cakes and I couldn't resist the temptation that was staring at me intently. I bought three boxes for myself and friends back home. As journalist Jehan Mohd describes it: "It was love at first bite." You will feel a "slightly gritty sensation when the bottom of the cake is put into the mouth," states a brochure inside the box. "This comes from individual grains of finely ground brown sugar crystals." "It is nice and rich without being overly sweet. It is soft and fluffy," says Jehan. For journalist Aref Omar eating the cake sends "a shot of bliss" through his taste buds "which takes me back to my childhood". The Castella is a heart-warming story of East meeting West. The cake was introduced to Japan by Portuguese missionaries (some accounts say Portuguese traders) in the mid-16th Century and it is one of the finest examples of Japanese innovation. The flavour is great and the history is fascinating. Altogether it is a very satisfying experience. I tasted the Japanese delight again when Takeshi Kokubu -- senior editor of The Nishinippon Newspaper -- presented every participant of the Third ACJC, which was held in Nanjing, China last November, with a box of Nagasaki Castella. The Fourth ACJC was held in Fukuoka City, Japan on December 14, this year. The obvious move for me, needless to say, was to go back to the same duty-free shop at Fukuoka International Airport for the Japanese sponge cake. The picture below shows journalists Suzieana Uda Nagu, Jehan Mohd and Sharifah Arfah enjoying the Castella with hot tea.